.HURRICANE KATRINA…A MOST POWERFUL HURRICANE WITH UNPRECEDENTED STRENGTH… RIVALING THE INTENSITY OF HURRICANE CAMILLE OF 1969. MOST OF THE AREA WILL BE UNINHABITABLE FOR WEEKS… PERHAPS LONGER. AT LEAST ONE HALF OF WELL CONSTRUCTED HOMES WILL HAVE ROOF AND WALL FAILURE. ALL GABLED ROOFS WILL FAIL… LEAVING THOSE HOMES SEVERELY DAMAGED OR DESTROYED. THE MAJORITY OF INDUSTRIAL BUILDINGS WILL BECOME NON FUNCTIONAL. PARTIAL TO COMPLETE WALL AND ROOF FAILURE IS EXPECTED. ALL WOOD FRAMED LOW RISING APARTMENT BUILDINGS WILL BE DESTROYED. CONCRETE BLOCK LOW RISE APARTMENTS WILL SUSTAIN MAJOR DAMAGE… INCLUDING SOME WALL AND ROOF FAILURE. HIGH RISE OFFICE AND APARTMENT BUILDINGS WILL SWAY DANGEROUSLY… A FEW TO THE POINT OF TOTAL COLLAPSE. ALL WINDOWS WILL BLOW OUT. AIRBORNE DEBRIS WILL BE WIDESPREAD… AND MAY INCLUDE HEAVY ITEMS SUCH AS HOUSEHOLD APPLIANCES AND EVEN LIGHT VEHICLES. SPORT UTILITY VEHICLES AND LIGHT TRUCKS WILL BE MOVED. THE BLOWN DEBRIS WILL CREATE ADDITIONAL DESTRUCTION. PERSONS… PETS… AND LIVESTOCK EXPOSED TO THE WINDS WILL FACE CERTAIN DEATH IF STRUCK. POWER OUTAGES WILL LAST FOR WEEKS… AS MOST POWER POLES WILL BE DOWN AND TRANSFORMERS DESTROYED. WATER SHORTAGES WILL MAKE HUMAN SUFFERING INCREDIBLE BY MODERN STANDARDS. THE VAST MAJORITY OF NATIVE TREES WILL BE SNAPPED OR UPROOTED. ONLY THE HEARTIEST WILL REMAIN STANDING… BUT BE TOTALLY DEFOLIATED. FEW CROPS WILL REMAIN. LIVESTOCK LEFT EXPOSED TO THE WINDS WILL BE KILLED. AN INLAND HURRICANE WIND WARNING IS ISSUED WHEN SUSTAINED WINDS NEAR HURRICANE FORCE… OR FREQUENT GUSTS AT OR ABOVE HURRICANE FORCE… ARE CERTAIN WITHIN THE NEXT 12 TO 24 HOURS. ONCE TROPICAL STORM AND HURRICANE FORCE WINDS ONSET… DO NOT VENTURE OUTSIDE! Many thanks to Meteorologist Bill Murray of ABC33/40 in Birmingham for bringing this statement back to light today on his blog, AlabamaWx.com. In his words, the words turned out to be prophetic. Why has it been so hot? And when is it going to end? The Mid-South summer of 2010 will likely be remembered (after the flooding rains of early May) for the intense and prolonged heat and humidity. The vast majority of the comments and questions I get from folks run along the lines of "when is this heat/humidity going away?" This post will hopefully answer two questions for you: when and why. First the why. 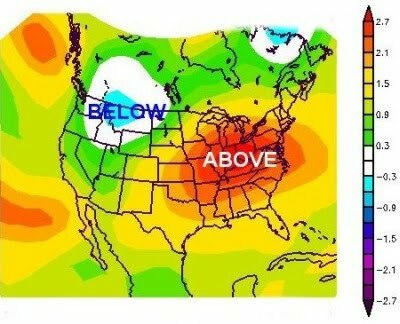 While the ultimate "why" may not truly be understood yet from a scientific viewpoint, the reason for this summer's unrelenting heat across much of the eastern and central U.S. can be found by looking up - into the middle reaches of the atmosphere. A recent blog post by The Weather Channel's well-known Severe Weather Expert, Dr. Greg Forbes, helps to explain. While the main focus of the post attempted to explain the abnormal heat and lack of summertime thunderstorms across central FL, it's pertinent for this region of the country as well. 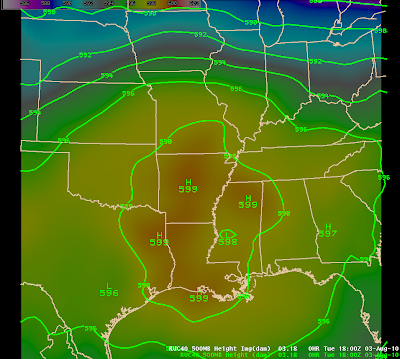 At about 20,000 feet up (meteorologists refer to this layer as the 500mb pressure level), a large and very strong ridge of high pressure has set up this summer over the southeastern portion of the U.S. Commonly referred to as the "Bermuda High," this summer it ended up being stronger and more well-entrenched than usual (see the image below showing the departure from normal of the pressures at the 500mb layer, courtesy The Weather Channel). This high pressure cell of warm air aloft kept frontal systems at bay well to our north for much of the summer, while also causing sinking air underneath it, which squashed the rising columns of air required to produce widespread thunderstorms. The strength and blocking nature of the high is directly responsible for the generally uncomfortable conditions we experienced 20,000 feet lower - at the surface of the earth. The image below shows the departure from normal for surface temperatures, which correlates well to the same areas experiencing the strongest high pressure in the first image (also courtesy The Weather Channel). So the next logical, or perhaps more pressing, question is, when does it end?? Well, I have good news! The frontal system passing through the Mid-South this weekend is actually the start of a transition we will be seeing over the coming days as the massive ridge of high pressure breaks down some and high pressure at the surface originates from the cooler northern climes rather than the tropics. The image below (click for larger image) is one model's forecast of the temperature, dewpoint, and humidity trends for the coming week. Notice in particular the downward trend in temps and dewpoints (a measure of humidity in the air) for the next several days, as well as the reduction in relative humidity. While our dewpoints have predominantly been in the 70s this summer (with a few brief spells of drier air), the long-term trend shows dewpoints dropping into the 50s next week. While it will still be warm, the air will be drier, so there will be less talk of heat index and definitely some cooler mornings to look forward to! Hang in there! Fall is also just around the corner! Below you will find an awesome time-lapse video of about 90 minutes of asperatus clouds condensed into 90 seconds of video, taken over State College, PA (home of one of the most widely-recognized schools of Meteorology - Penn State) by Accuweather meteorologist and blogger, Jesse Ferrell. As you watch, pay particular attention to the wave action in these clouds. Truly fascinating! Let me know what you think by commenting on this post. Jesse's blog and additional still pics can be found here. A cold front will move through the Memphis metro area this evening and stall across north Mississippi, bringing an end to the near-100 degree temperatures and Excessive Heat Warnings of the past week. It will also help to lower humidity levels a little by Monday, which was the second factor (besides the heat) contributing to the heat warnings. The Heat Warning will be replaced by a Heat Advisory along and south of I-40 (including the metro area) for Monday as it will still be hot by all accounts (mid 90s) with a little leftover humidity. Heat index values will be near 105 in the I-40 corridor. As we head further into the week, the dewpoints (a measure of humidity) will slowly begin to rise again, though more cloud cover and daily rain chances (albeit low) will keep temperatures in the lower to mid 90s. Heat Advisories are possible, but we won't be dealing with the extreme heat like the past couple of weeks. There are some signs that point to a little more heat and humidity again heading into next weekend as the upper-level high pressure system rebuilds over the region. We'll wait to see how that pans out. In the meantime, check out the MWN Forecast for Greater Memphis for details on this week's expected weather. Recap of the record heat wave - more on the horizon? The Mid-South suffered through a heat wave of record proportions this past week, the hottest since 2007. Due to a massive ridge of high pressure over the area, temperatures climbed into the triple digits for four consecutive days at Memphis International Airport and overnight lows remained in the 80s for five days as well. The map above (courtesy NWS-Memphis) depicts the 500mb (or about 18,000 feet) level of the atmosphere at mid-day on Tuesday, in the middle of the heat wave. 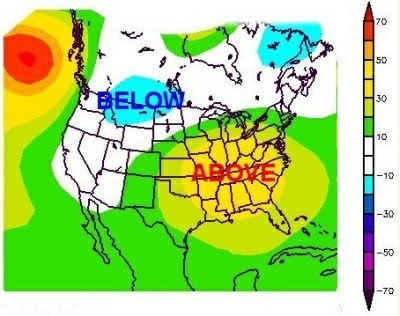 The very strong ridge of high pressure is depicted square over the region, resulting in the extreme heat. Accompanying the heat was moisture-laden air, that resulted in high dewpoint values (and high relative humidity), creating heat indices that routinely eclipsed 110 degrees and topped 120 in some locations. The high heat indices resulted in Excessive Heat Warnings for the entire area for several days. In fact, much of the southeast and south-central U.S. was under Heat Advisories or Excessive Heat Watches or Warnings by mid-week (see the image below showing the heat-related advisories on Wednesday morning). Below is a summary of the high and low temperatures for August 1-5, with records set or tied marked with an asterisk (*). The all-time warmest low temperature for Memphis was tied at 84 degrees on the 3rd. With the passage of a cold front on Friday, much of the Mid-South got a slight reprieve from the heat, but the break will be short-lived as another ridge of high pressure builds over the region beginning tonight. The ridge will once again help to push temperatures into the upper 90s and towards the century mark beginning Sunday. Though it doesn't appear this heat wave will be quite as intense, highs near 100 will be possible throughout the next week, with lows once again only dropping to near 80 in metro areas. High temperature records may not be broken, but overnight lows could be. After last week's heat, the problem this coming week could be more in it's duration rather than intensity. Heat is a silent killer and the dangers multiply as the hot days tick by. Please take all necessary precautions this coming week to prevent heat illnesses and check on the elderly, very young, and your pets frequently. If you are tired of all of this "heat talk," check out the first winter weather outlook of the year, issued by Accuweather. July continued the very warm pattern that began in June. A streak of consecutive days with high temperatures at or above average ended on the 13th at 53 days. For the month, the average temperature was 84.9 degrees, which was 2.4 degrees above normal and ranked as the 7th warmest July on record. The average high temperature was 93.8 degrees, with only one day not reaching a high of at least 90 (89 on the 17th). The maximum temperature for the month was 98 degrees on the 31st and the lowest was 69 on the 2nd. No daily temperature records were set during July. Also of note: the period of June and July combined were the 2nd warmest June/July period on record, trailing only the historic summer of 1980 by a mere 0.2 degrees! As far as precipitation was concerned, the vast majority of the month continued the dry trend of June. However, a deluge at mid-month caused the precipitation total for the month of 6.30" to end up 2.08" above normal. There were 8 days with measurable rainfall. One the 12th-13th, a total of 5.56" of rain fell, or 88% of the month's total. A precipitation record was set on the 12th with 4.56" of rain recorded. The peak wind gust was 44 mph, also on the 26th. Click here for the NWS climate recap for July. Bartlett also saw a very warm and wet month. The average temperature for July at the WXLIVE! station in north Bartlett was 83.7 degrees with a maximum of 98.7 on the 31st and a minimum of 60.9 degrees on the 2nd. The high temperature failed to reach 90 on only 2 days (including 89.9 on the 1st). After a dry June, July precipitation ended up well above normal with a precipitation total of 8.07", including 4 days with rainfall totals of 1" or greater. A co-located manual gauge used for the CoCoRaHS program measured 8.42" in July. The peak wind gust was 27 mph on the 26th. Click here for a daily statistical recap on MemphisWeather.net. For the month of July, the average temperature error in all MWN temperature forecasts was 1.67 degrees, the best among all compared computer models (by more than 20%) and the National Weather Service (by 2.4%). MWN's forecasts extend out five periods (or 2.5 days). Over 77% of the MWN temperature forecasts for the month were within 2 degrees of actual. For dewpoint accuracy, the MWN forecast was also the best of the data sources at 1.64 degrees average error and was within 2 degrees of the actual dewpoint 75% of the time. More detailed accuracy statistics can be found here. Get the latest weather conditions and forecasts and much more by checking out MemphisWeather.net on Facebook and Twitter! .THE HOTTEST AIR OF THE SUMMER WILL SPREAD INTO THE MIDSOUTH OVER THE NEXT FEW DAYS. THE HOT TEMPERATURES IN COMBINATION WITH HIGH HUMIDITY WILL RESULT IN A PROLONGED AND DANGEROUS HEAT WAVE. HEAT INDEX READINGS WILL PEAK AT LEVELS IN EXCESS OF 110 DEGREES ACROSS ALL OF THE MIDSOUTH. OVERNIGHT LOWS WILL FAIL TO DROP BELOW 80 DEGREES IN SOME LOCATIONS. THIS WILL RESULT IN EXTREME HEAT STRESS ON THOSE WITHOUT AIR CONDITIONING. PROPER PRECAUTIONS SHOULD BE TAKEN TO STAY COOL. THE NATIONAL WEATHER SERVICE IN MEMPHIS HAS ISSUED AN EXCESSIVE HEAT WARNING... WHICH IS IN EFFECT UNTIL 9 PM CDT MONDAY. THE HEAT ADVISORY IS NO LONGER IN EFFECT. THE EXCESSIVE HEAT WATCH IS NO LONGER IN EFFECT. * HEAT INDEX READINGS WILL CLIMB TO BETWEEN 110 AND 113 DEGREES TODAY AND AGAIN MONDAY. * THE HIGHEST HEAT INDEX READINGS WILL OCCUR BETWEEN 10 AM CDT AND 9 PM CDT TODAY AND AGAIN MONDAY. * HEAT INDEX READINGS OF 110 DEGREES OR GREATER CAN BE DEADLY IF THE PROPER PRECAUTIONS ARE NOT TAKEN. YOUNG CHILDREN... ELDERLY PEOPLE... AND THOSE WITH ILLNESSES OR HEART CONDITIONS ARE MOST AT RISK. * EXCESSIVE HEAT WARNINGS OR HEAT ADVISORIES WILL LIKELY NEED TO BE EXTENDED ACROSS THE AREA FOR MUCH OF THIS WEEK. MAXIMUM HEAT INDEX READINGS OF 110 DEGREES OR HIGHER MAY OCCUR FOR SEVERAL DAYS. IN ADDITION... OVERNIGHT LOWS WILL LIKELY NOT DROP BELOW THE LOWER 80S ACROSS PARTS OF THE AREA. PROPER PRECAUTIONS SHOULD BE TAKEN TO STAY COOL DURING THIS DANGEROUS AND PROLONGED HEAT WAVE. AN EXCESSIVE HEAT WARNING MEANS THAT A PROLONGED PERIOD OF DANGEROUSLY HOT TEMPERATURES WILL OCCUR. THE COMBINATION OF HOT TEMPERATURES AND HIGH HUMIDITY WILL COMBINE TO CREATE A DANGEROUS SITUATION IN WHICH HEAT ILLNESSES ARE LIKELY. DRINK PLENTY OF FLUIDS... STAY IN AN AIR-CONDITIONED ROOM... STAY OUT OF THE SUN... AND CHECK UP ON RELATIVES AND NEIGHBORS.